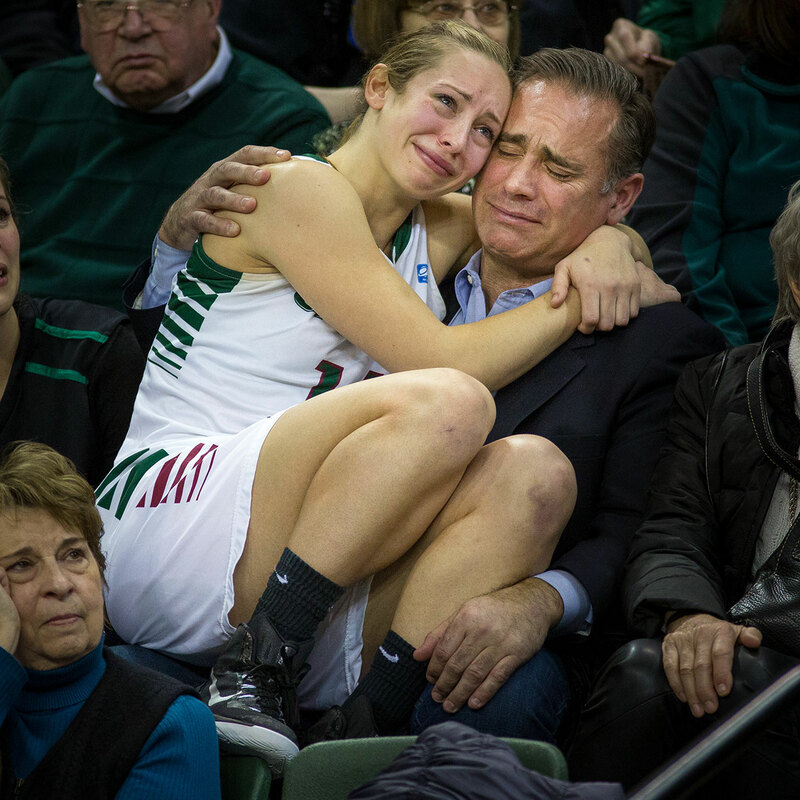 An Emotional Senior Day For Green Bay Women’s Basketball • Green Bay Sports Photographer. As a photographer you’re always trying to tell a story through photos. Last Saturday my job was to tell the story of the Green Bay women’s basketball senior day for one of my higher education photography clients. 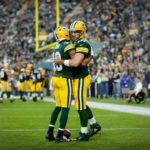 I’ve covered a number of these events as a sport photographer for the University of Wisconsin Green Bay and they never disappoint in delivering emotional moments. The men’s teams are a little more reserved and their emotional expressions more condensed; the women’s tend to include more tears and last a little longer. 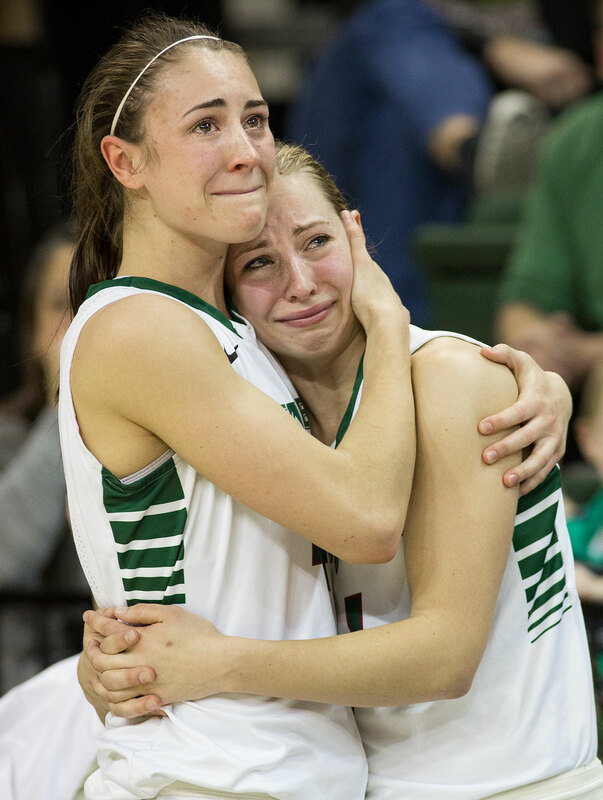 On Saturday, Green Bay said good bye to their two seniors, Ellen Edison and Megan Lukan. Ellen went first with her long list of people that she wanted to thank for her success. Then came Megan who is from Barrie, Ontario Canada, who has a younger sister, Kaili Lukan, on the team. Megan knew she could never get through her list without choking up so she recorded it and it played on the big video monitor above the court. Megan shed a few tears as she watched herself on the monitor and it made for story telling pictures, but when she got around to thanking her family, that’s when things really got emotional. When she talked about her sister, they met in front of the players bench and hugged. When she talked about her dad, she made her way in to the stand and sat in his lap. That was a very touching and emotional moment. Even with her adult 5’7 frame sitting in her dad’s lap, you could see her as a young girl honoring that special connection with her dad. Her dad’s expression tied everything together to make it a very memorable moment. Later that day I posted the photo of father and daughter to my social media accounts and I got a lot of positive feedback, but the comment that meant the most to me was by Megan. “They say a picture is worth a thousand words…I think this sums up how emotional I was today. 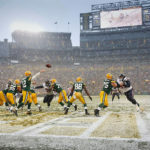 Thank you everyone for all your support today and over my career here at Green Bay”. Megan asked if she could get a print of that frame; that’s definitely a request I will follow through with so they can remember the moment. 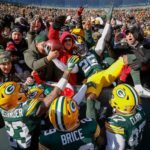 The Green Bay women’s team isn’t done for the year. The Phoenix will be hosting the Horizon League Women’s Basketball Championship. Hopefully I’ll be covering them in the championship game next Sunday. Megan Lukan goes in to the stands to hug her dad John during senior day for the Phoenix. Megan Lukan hugs her younger sister Kaili.